← Can David Wright Finish Above .400? The L.A. Kings are on their way to the Stanley Cup Finals. Its their first time since 1993 when NHL Legend Wayne Gretzky played for the Kings. The Kings have never won the Stanley Cup and are more than ready to capture it this year. The Kings had an average regular season finishing with a record of 40 wins, 27 loses and 15overtime loses. When April started and the final games before the post season were about to be played many thought the Kings would not even qualify for the playoffs. Well they did but barely and got the placed in the playoffs as the 8th seed. The Kings faced off against the 1st seeded Vancouver Canucks and shocked the hockey world by taking the series in 5 games. It was their first time making it out of the first round since 2001. The Kings then swept the 2nd seeded St. Louis Blues and the hockey world started to think, maybe these guys are for real. Last night it was confirmed when the Kings took game 5 against the Phoenix Coyotes by a score of 4-3 in overtime to advance into the Finals. The Kings made history during this incredible playoff run by being the first 8th seeded team to beat both the 1st and 2nd seeded teams in the playoffs. The Kings star through this playoff season has been their American born Right Wing Dustin Brown. Brown scored 7 goal, 9 assists and had 3 game winning goals in the playoffs. He has been their leader and the rest of the team has followed with incredible play. If he keeps it up he will definitely take the MVP trophy in the Stanley Cup. The Kings must wait now to find out their opponent. The New York Rangers and New Jersey Devils are still battling it out in the Eastern Conference Finals. The Ranger and the Devils are set to play Game 7 tonight in New York. I have a feeling that the Rangers will take the game and advance to their first Finals since 1994. We will find out really soon. 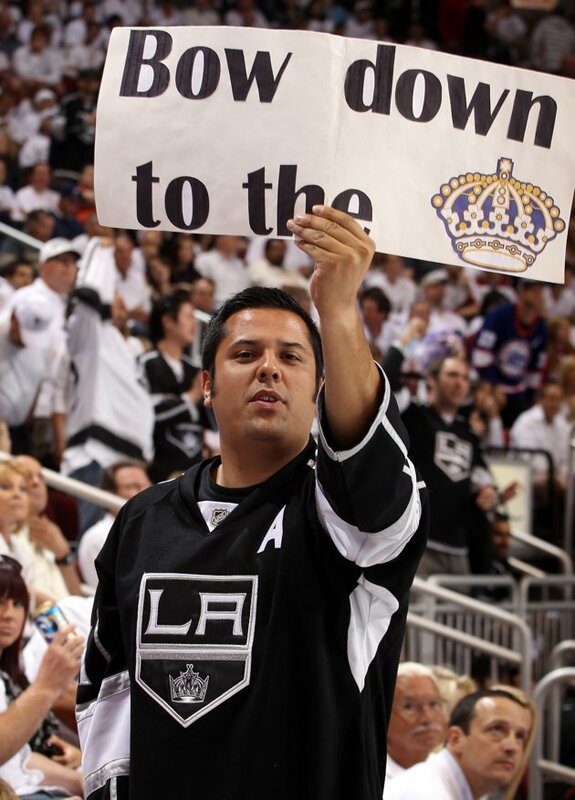 L.A. Kings fan holding a sign that says it all. The Kings have really sparked interest in Los Angeles for Hockey. The city has had their loyal fans but the casual fans left when Gretzky went to play for the Rangers in the late 1990s. The L.A. Sports Scene is really different this summer with the Lakers and the Clippers already out of the NBA Playoffs. The city of Los Angeles needs the Kings right now. This is the perfect opportunity for the Kings to brighten up the city with Hockey excitement. I feel this is a Kings team that is destined to win the Cup this year. I did not think so going into the playoffs but I have seen the playoff greatness. This would be one of the most surprising NHL Playoff runs we have ever seen if they can capture the cup. We could be calling it the “King’s Cup” in just a matter of a couple of weeks. This entry was posted in NHL and tagged 1993, 2001, america, american, clippers, devils, dustin brown, finals, hockey, ice, kings, kings tickets, lakers, los angeles, los angeles tickets, new jersey, new york, NHL, playoffs, rangers, sports, sports schedule, stanley cup, stanley cup tickets, watch the stanley cup, wayne gretzky. Bookmark the permalink. You could be right. The Kings look good and unstoppable. And will have plenty of time to rest. Its going o be a good series with the Devils, I still think the Kings can take it. Thanks for reading Hank!